2LF - YOUNG - "The Voice of the South West"
"The Voice of the South West"
Ideally situated in the heart of one of the Commonwealth's wealthiest districts, Station 2LF, from Young, dominates an area of over 11,000,000 acres containing a population of nearly 106,000. Young, apart from being the centre of a vast agricultural, pastoral, fruit growing and poultry raising district, possesses one of the largest cherry orchards in the world. 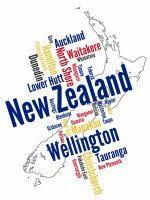 This progressive and flourishing district is favoured with an unsurpassable climate. 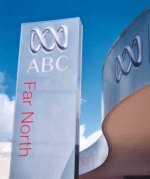 Firmly affiliated with the Macquarie Broadcasting Network, 2LF brings to the homes of Grenfell, Cowra, Canowindra, Forbes, Temora, Yass, Gundagai, Cootamundra, Harden-Murrumburrah and numerous other towns, the topline stars in radio, the "Macquarie Feature" programmes and sporting services of local and State interest. Always, on the spot, 2LF covers each of the famous Maher Cup Rugby League games, following the Cup as it moves from town to town. This, one of the many outside broadcasts, performed by a trained sporting staff, is the highlight of wintertime months in the districts of the South West. Its popularity has spread as far afield as New Guinea - as evidenced by letters of appreciation from Servicemen stationed in the Islands. 2LF serves old and Young alike, catering for the varied tastes of its listening audience. Managing Director of 2LF with headquarters at 2CA Canberra, is Clive Ogilvy. The Voices behind the microphone of 2LF command wide listener interest. All are personalities, in all they are a team working in harmony, to bring a friendly touch into the homes of listeners. 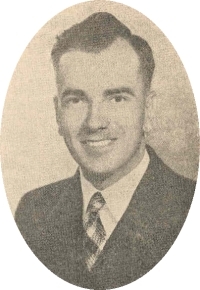 E. JOHN STEVENS, born in Dunedin, is Manager of Station 2LF, and has been associated with the Macquarie Broadcasting Network since 1937. He was with 2CA, Canberra, until his enlistment in the A.I.F. in 1942. 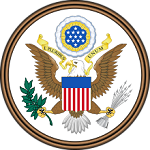 War service took him to New Guinea where he served in a Signal Unit later transferring to the Army Amenities Broadcasting Unit. 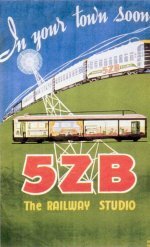 Having graduated from a Junior Announcer - copywriter to a most competent programme arranger and chief announcer, Mr. Stevens returned from Active Service, and was appointed Assistant Manager at 2CA. Recently he became Manager of Station 2LF. 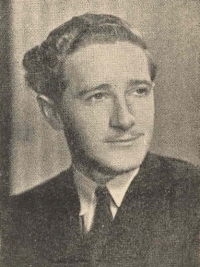 John Stevens is the son of a pioneer of Radio in Australia, the late Capt A. C. C. Stevens - who commanded the attention, and gained the interest and admiration of thousands of Australian listeners. Combining a sound knowledge of music and announcing together with a flair for organisation and administration, he has already made many friends in Young and surrounding districts. Mr. Stevens combines with managerial duties a little announcing on Sunday evenings, and also is associated with the "Maher Cup" Rugby League broadcasts. DAVID JAMIESON, Announcer - Copywriter - First appearance on the air was in the Children's Programme, "Station K.I.D," presented by 2GB, which he compered on the opening night, and in which he made several other appearances as compere. David took part in eleven discussion groups in ''Over to Youth" - a Commonwealth-wide broadcast from the A.B.C., while studying Arts at the Sydney University. He spent the next two years farming on the coast, with one break of three weeks as relieving announcer at 2HR. In October last year, he took up breakfast and luncheon announcing at 2CA, until the end of January, when, after another month of farming he went back to 2HR. Recalled to 2CA, he spent a few weeks there, before being transferred to 2LF. David presents a twice - weekly feature "Interlude with Romance," and the Saturday night 10 p.m. till midnight Modern Dance Programme. LES DEVINE. Chief Announcer and Programme Director. Born in Ararat, Victoria and educated at the Grammar School of his naive town. On leaving school he took up Wool Classing and travelled Australia extensively. 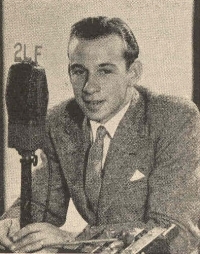 Though he passed several exams as a wool classer, Les finally decided that his place is in radio, so in 1942 he accepted a position as announcer on Station 2LF. Since then he has held the position of breakfast announcer, and is now programme director. Les also handles all descriptions of the Maher Cup Rugby League matches in which regard he is rapidly making a name among the sporting fraternity. 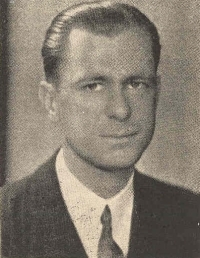 JOHN MERCHANT. Announcer - Sales Representative at 2LF has been in radio for the past thirteen years. After leaving school in Sydney bearing the Dux's cap he dabbled in journalism. 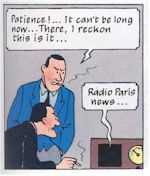 Then, in 1933, he entered radio. John's first appointment was to 2XN (now 2LM) Lismore, as announcer - copywriter. Two years later 2WL Wollongong, claimed him as programme manager – announcer. He spent five years with 2WL, his final appointment there being as Sales Manager. Mr Merchant then transferred to 2LF and was employed at this station until he enlisted in the A.I.F. He has only recently returned but has already re-established himself as a favourite with listeners. 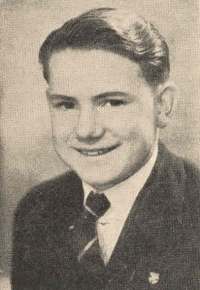 John Merchant's most popular sessions are his "Saturday Nighters' Club" and the Sunday morning "Listener - Arranged Programme." JOHN O'REILLY. A native of Young, who was educated at the Christian Brothers College, Young, joined the staff of 2LF early last April. This is his initial entry into the radio world and he is rapidly progressing as a Cadet - announcer and copywriter. John is heard to good advantage conducting 2LF's breakfast sessions. Recently he inaugurated a "Hill Billy" Club as an additional feature to his morning programmes. John has a pleasing voice and with experience will develop into a top rate announcer. MARY COLLINS. Although Young is Mary's home town, she was educated in Sydney at Loreto, Kirribilli. Later she studied singing at the Sydney Conservatorium. At the same time, with a view to entering the radio world, she took a secretarial course at the Metropolitan Business College. The opportunity to enter radio came, when returning to Young, she was offered the position of Children's Session announcer at 2LF. She accepted, later graduating to Women's Sessions and other features. 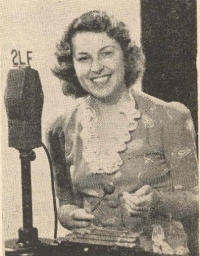 During the War, Mary held a full-time job as straight announcer at 2LF. Now she combines Women's feature Sessions with script writing and secretarial work. MISS BETTY SAINES is 2LF typiste. TECHNICAL ASPECTS OF RADIO 2LF. 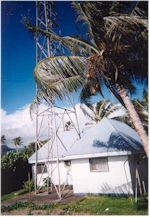 The Technical Facilities at Radio 2LF are under the supervision of Chief Engineer S. ADAMS, who joined the staff last May, coming from Sydney, where he was well known as services manager for a large city radio store. Mr. Adams has installed much necessary equipment, replacing that which had deteriorated during the War years. There is still much to be done, and included in the future plans are a brand new studio installation with the latest technical advancements. Applications have also been lodged for Frequency Modulation sites throughout the coverage. High frequency outside broadcast pickup units are also being prepared to cover such broadcasts as the Maher Cup Rugby League games. The present transmitter and studio equipment is of Transmission Equipment manufacture, and employs plate modulation of the final. It is capable of 500 watts. The licensed power is 300 watts. The studios are located in Young, and the programme is fed via land line 3 miles to the transmitter. The aerial is a quarter wave grounded Marconi of tubular steel construction. SIDNEY ADAMS. A New South Welshman by birth, Sid Adams aspired to radio engineering at an early age. Much midnight oil was burned, and it wasn't long before he was a successful service technician. 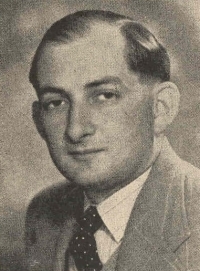 Sid joined the staff of 2LF as Chief Engineer in May, 1945 and soon proved that he could do more in broadcasting than "keeping the station on the air," as sales figures proved. In addition to Mr. Adams, 2LF has on its technical staff Mr. D. I. JOHNSON and Mr. J. HANNON. Towards the latter period of the War, 2LF made its technical staff and facilities available for emergency service. The station is engaged in association with the Burrangong Shire Bushfire Radio control network. Leading district amateur radio men, Mr. J. TAYLOR and Mr. A. THACKERAY are associated with this work. The method of procedure is for field units to be taken the fire front. These units are in direct touch with 2LF studios and the control centre at the Shire Clerk's Office. In the event of warnings to the public becoming necessary, due to changes of wind etc., a message is radioed direct from the fire to 2LF, where the programme is interrupted to broadcast the warning. It has not yet been necessary to utilise the network, but the many tests conducted give confidence that much property and stock will be saved if the occasion arises. 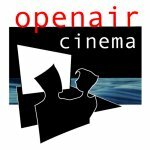 This is something new in broadcasting, and no doubt will provide an example. 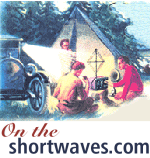 Hours of Transmission: 7 a.m. to 10.30 p.m. Daily; Saturdays to midnight. 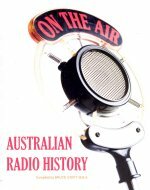 2LF - YOUNG, 'Broadcast Year Book and Radio Listeners' Annual of Australia 1946-47.